I’ve kept this blog under hibernation during the last couple of weeks. The reason: bad wrist + elbow. An advice for those doing a PhD or other academic work for that matter: ensure good ergonomics when you use the computer and use it just a short period at a time. Hell will follow if you don’t, and will cut your time on the computer anyway. That’s what happened to me, but I am slowly getting better. It is also preventing me from doing sports I usually loved to do 3 times a week – fortunately my legs are doing just fine, so I can do running now. So, call for all you tangible and embodied computer scientists and developers out there: can’t we for my wrist’s sake get rid of this rigid and slow mouse-operating system already?! I haven’t been too active on Twitter either, so not too many posts from there. Anyone interested in attending another interesting conference in human-computer interaction, check out CHI 2016. I hope to be there next year as I missed South Korea last year. This week I attended the annual Curtin Business School Higher Degree by Research Colloquium. It was nice to win the best paper award in the Information Systems category. Still, the biggest achievements that I feel the colloquium pushed me to do was creating the initial literature review paper in virtual embodiment that I hope to continue to a journal article and a research poster about doing a literature review by using phenomenology. The “little thing” doing that poster made me achieve was to better realise how phenomenological research process (as advocated by Moustakas, 1994) might actually take place. 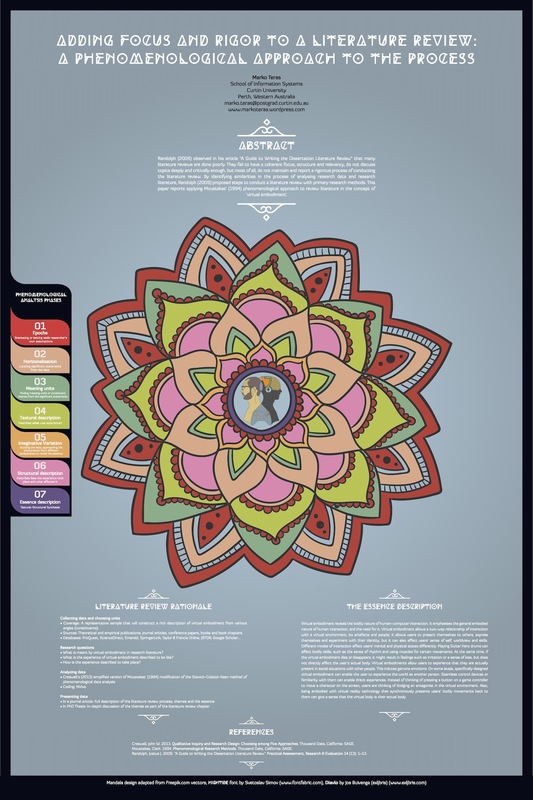 It helped me to sketch an out-of-this-world mandala (see the poster below), a process which made me to get the analysis process better – naturally actually doing and experiencing the phenomenological literature review process helped in that too. Thus the mandala and the poster is not just a pretty picture, but an articulated structure of my recent understanding – which makes a nice memory item at the same time. So I recommend anyone to play around with drafting and sketching with one’s research ideas/processes beyond the ordinary linear and grey flowcharts we are too much used to see. Understanding is multidimensional, coloured, spatial, temporal, and can be presented on a 2 dimensional surface with various creative ways that are more accurate than using “commonly approved ways of representation”.